It’s many years since I have set foot in Harrods, but the thrill of entering the hallowed halls still lives on. As an awestruck country girl, this acme of department stores, situated in exclusive Knightsbridge, was an Aladdin’s cave of delights. The food halls in particular live on in my memory. As a cash strapped student, I would enter and just breathe in the exotic air, rich with spices and other fragrant compounds. I’d gaze at the sumptuous riches all around and at the luxurious chocolates in particular. Well if I can no longer get to Harrods, Harrods can come to me. Or at least it did recently in the form of this strikingly elegant hamper. It had to be chocolate of course. Initially, I chose the East India Collection which was full of Eastern promise and had some interesting flavours that particularly appealed to me. It also contained a jar of chocolate cane sugar which I find most intriguing and was keen to try out. Sadly, Harrods was out of stock at the time, so I chose this Celebration of Chocolate instead, retailing at £125. The hamper arrived well packaged and in good condition. The black and gold colour theme conjured up an air of regal livery. If only I had an impeccably dressed man servant to carry the hamper for me, my life would be complete. Wait a minute, I’ve got the not-so-impeccably dressed CT.
Unpacking the contents, I was making a mental note of who was going to get which of the enclosed delights. Everything looked to good to tuck into before Christmas. The dark chocolate coated orange sticks would go to my mother. When I made my own version of these, she thought they were one of the best chocolate combinations she’d ever had. The dark coated ginger sticks were headed in her direction too: it’s her birthday on New Year’s Eve and these are a particular favourite of hers. The dark chocolate used is a 67% house speciality. The whiskey truffles, also coated in dark chocolate, sound like something I’d really like to try and would make great after dinner chocolates to have with friends. The dark chocolate coated shortbread biscuits are made for sharing too. I haven’t yet decided who will get the milk chocolate truffles and what I shall be doing with the two bars of couverture chocolate – one white 28% and one milk 41%. As I am rather partial to a high cocoa content milk chocolate, I suspect I might just be hiding the latter away for myself. To complete the package, there is a selection of ten dark, milk and white chocolates which CT and I took upon ourselves to try for the purposes of this review. Rose and Earl Grey ganache with a smooth mousse like texture enrobed in milk chocolate. Dark chocolate covering a sweet white firm textured substance that reminded me of honey nougat. Milk chocolate containing a crunchy praline with pieces of feuilletine. A firm and fruity strawberry ganache enrobed in creamy white chocolate. Dark chocolate rum truffle which was less sweet than the others and had a nice zing of rum to it. You can check online to find out what other amazing Christmas hampers Harrods have to offer. I was sent a Harrods hamper to review. There was no requirement to write a positive review. As always, all opinions are my own. Lovely post. I too have memories of Harrods as we did an event there a few years ago … The stories I could tell! Love the hamper. Very generous. Oh how lovely, getting a harrods hamper delivered to your door is a treat indeed. What a beautiful hamper. 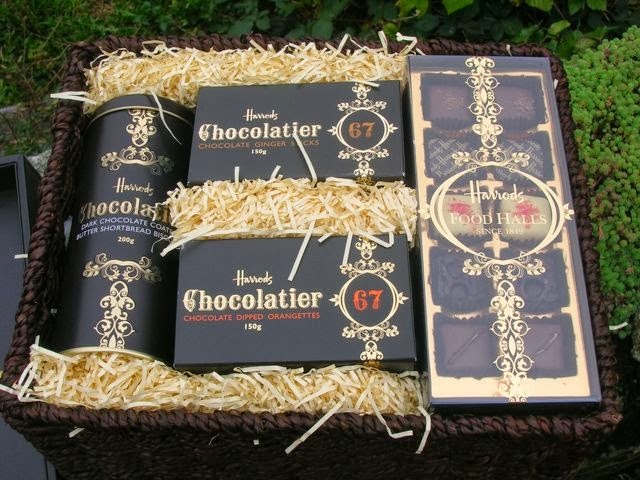 A proper luxury present for chocoholics! What a treat. Gorgeous hamper. Only wish Harrods would deliver on to my door! What a treat!! I am in heaven just looking!